Recently I found an old Geiger muller DIY in my basement. So I took the GM Tube from DIY out and made a new ginger counter using actual accessories and a LCD display to show the radiation-measurement. Boost regulator module to converter 5v Batteries to 12v. The project consisted of a GM Tube, a high voltage Power supply and a detector circuit. At the end the counts will be shown on a LCD display. 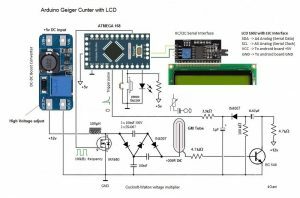 The device will be powered by a 5v battery. To GM Tube needs up to 340 Voltage to work. up from a 5V power supply. 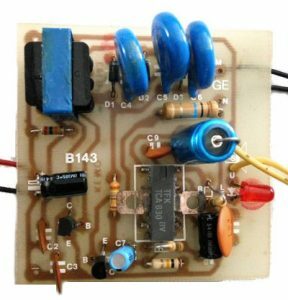 To create GM HV power from 5v, I made a voltage booster by using a ATMega168 micro controller. 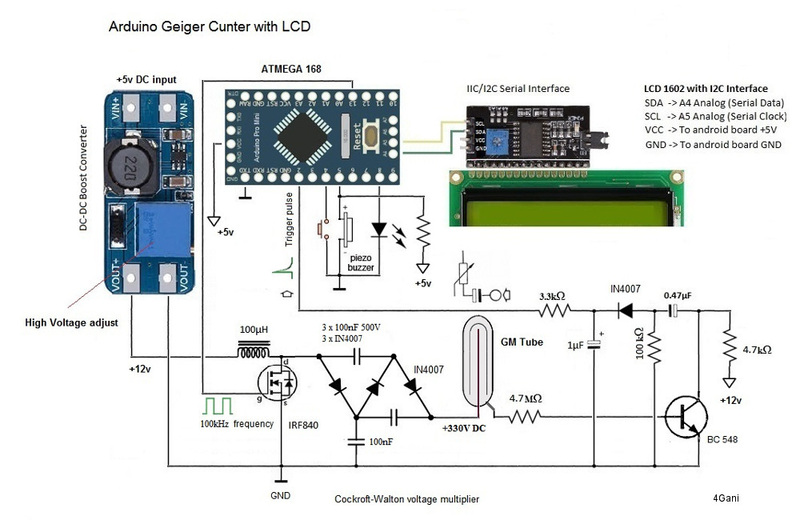 The micro controller generates PWM waveform and to switch a MOSFET. The MOSFET receives the switching signal(~40kHz) from the ATMega168 (pin 13) and works together with L, D and C as a boost converter and produces 180V. (as shown in the circuit). This inductor(L) released energy giving the diode a specified voltage which depends on the duty cycle and the switching frequency , inductor value and input voltage. My main problem was that the produced output could not go above 180 volt, as long as I tried. Therefore, I used a voltage multiplier so called as Cockroft-Walton which consisted of 2 x IN4007 and the associated 2 x 10nF capacitors to get an output voltage by factor of two (340Volt). I can simply regulate the output HV voltage by changing the input voltage (boost regulator module). This voltage ~340V feeds the GM tube. The GM tube output triggered an interrupt on the Arduino, which registers the event as one count. You can generate a PWM signals with variable frequency and variable duty cycle, but in my case was not necessary. The normal GM operating voltage range is between V1 and V2 (see the diagram). 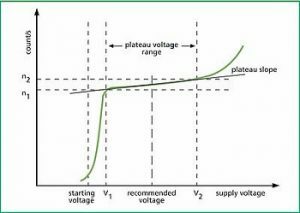 The optimum operating voltage will be about the middle of the plateau. In my case the potential difference between the anode and cathode varies in the range of 300 to 340 volts. (The duty cycle is not exact and the micro-controller is busy with other tasks). A resistor of 4.7 Mega ohm reduces the GM voltage. 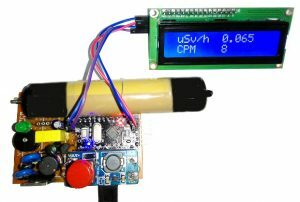 make a dc-dc boost convertor with Arduino by generating PWM frequency with On/Off time of 50 µS. I implemented PWM on pin 13 by repeatedly turning the pin on and off for the 50µs times. count the ionization events over a certain period of time and display the results in counts per minute (cpm). The impulses an Arduino input pin(2) are very narrow mit very low frequencies. I made also a push button, based on I can changed between display radiation per hour, CPM or total counts by time. Each input signal will be produced a sound and illuminated a LED . As you know, there are three types of radiation: alpha α, beta β and gamma γ and x radiation. The structure of Geiger Tube is a very simple. The tube inner surface is completely covered with conductive metal. In the middle the tube exists a needle and is filled with gas. 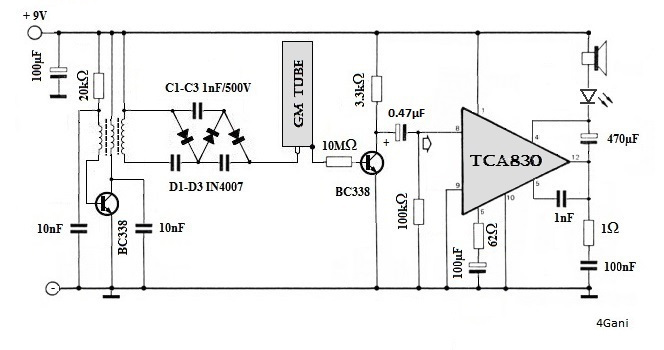 Normally the basic voltage of tube is up to 300 volts and it’s usage is ca 100 µA. The potential difference between the surface and the electrodes creates an electric field. When a beam or a particle enters into the volume of gas, ionizes the gas atoms. This field in the gas applies a force to the ions and leads positive ions to negative surface and negative ions towards the positive electrode. 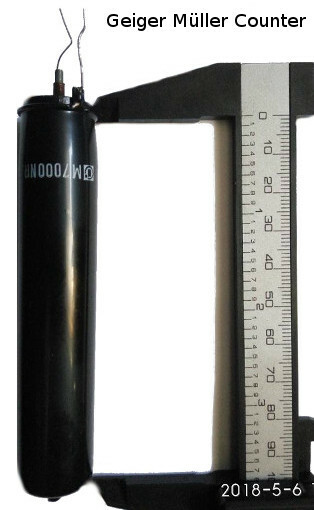 It measures very inaccurately (+/- 50% measuring error) and does not differentiate between alpha, beta and gamma radiation. 40μSv – The radiation you receive during 5 hours flight over 8000 meter height. Neulich habe ich im Keller ein “Geiger Müller Zähler” Bausatz von Fima Kemo-Electronic (B143) gefunden. Vermutlich dieses Kit wurde von Firma Kemo vor Jahr 1986 verkauft und weiss nicht wie ich darauf gekommen bin. Leider habe ich keine Information über das Kit und Zählrohr. Das Zählrohr ist höchstwahrscheinlich aus DDR. Es hat eine Länge von 10cm und mit 2cm Durchmesser. Es ist ein einfaches Bausatz und besteht aus einen Oszillator und ein Transformator. Das Trafo wird für die Erstellung von ca. 300 Volt benutzt. Um jedes einfallende ionisierende Teilchen hörbar zu machen, wird einen Audio-Verstärker (TCA830) mit einem Lautsprecher verwendet.